Earlier this year, director Neill Blomkamp released numerous pieces of artwork for an Alien sequel he teased may be his next project. Just one month later, 20th Century Fox was on board, and Alien 5 was officially happening, with original Alien director Ridley Scott set to produce. Ridley Scott is still set to direct Prometheus 2, and we reported in March that Alien 5 won't interfere with the director's plans for that sequel. As it turns out, it's the other way around, with a report from Bloody-Disgusting claiming that Ridley Scott wants to make Prometheus 2 before Alien 5. Here's what an unidentified source had to say. 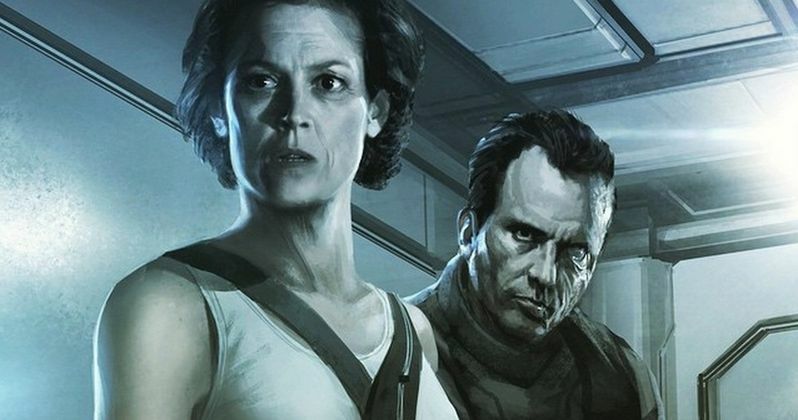 "Alien 5 is still very much in the works, as Fox remains hot on the idea. Blomkamp continues to work on the script (only an outline existed previously) and refine the tale he is telling. Ridley Scott is still producing, but has insisted on Prometheus 2 being made first." We reported earlier this month that Prometheus 2 will start production in January 2016. 20th Century Fox had previously issued a March 4, 2016 release date, but now there is no specific release date in place quite yet. The report also reveals that this delay could also be a blessing in disguise, since it will clear up scheduling difficulties Sigourney Weaver may have with James Cameron's Avatar sequels. It will also give Neill Blomkamp more time to develop the screenplay. Ripley's fate was left uncertain at the end of Alien 3 as well, with her character literally left floating in space. Ripley did return as a clone in Alien Resurrection, but it isn't clear if that story aspect will be taken into account in Alien 5. It isn't known how far along Neill Blomkamp is on the story yet, but hopefully we'll hear new details soon. If all goes to plan, Neill Blomkamp will start shooting Alien 5 in 2017, which would allow 20th Century Fox to release Prometheus 2 in 2017 and Alien 5 in 2018. Michael Biehn, who was depicted in the director's early concept art, is believed to come back as Corporal Hicks. The actor recently claimed that this new project would ignore the events of Michael Biehn, where his character was killed in the opening moments. This unidentified source, though, claims that may not be happening, but it's far too early in the development process to know for sure. Would you rather see Alien 5 before Prometheus 2, or the other way around?